Friday Follower Freebie: Pumpkin Polish Edition! You knew I couldn't just pick up the Blue Cross Pumpkin Polishes for myself and not pick up a set for one of my followers too! One of you will receive six Pumpkin Polishes, which you can use to decorate your nails, or place them strategically around your house if you're short on Halloween decorations! The photo above is a little dark, so if you'd like a better look at the polish colors and glitter details, you can see my earlier photo here. If you'd like to enter for a chance to win these little cuties, just leave your eMail in the comments section below. The winner will be announced Monday morning (10/3), and I'll leave the entry period open until then. Followers only, please. I'm such a nail polish newbie I only recently learned what the pumpkin polishes ARE! I haven't been able to find these anywhere! I've been subscribing for awhile via Reader, so I'm not sure if I qualify (though I just officially jumped on as one of your followers via your page). Rite-Aid in my area doesn't have these in YET (I hope). Thanks for the giveaway! I'm at everythingblue[at]gmail[dot]com. Those bottles are so cute! It would actually be a shame to use the nailpolish, they'd definitely be an unique decoration! Just saw these at my local grocery store.....so cute! Thank you i really love these bottles! I'm crossing my fingers that I'm the lucky winner because these are not in my area. These are so cute, I love Halloween stuff! vivalagenesis at gmail dot com. So cute, I would leave them as Decor if it wasn't for a mischievous 2 yr old. Thanks for doing this! I have been looking for these everything. I follow via GFC so hopefully it shows up because it is acting weird. I have been looking for pumpkin polishes and can't find them. I can't get these where I live. Thank you for this giveaway! Hahaha, I laughed at the "place strategically around the house" bit. These pumpkin polishes aren't sold where I live so I have my finger crossed! So pretty ! Thank you ! thanks for this fantastic giveaway!! and i really love reading your blog(: makes me happy! I wish I could find these in Canada! Those are so cute! I have one, but I would love to add more to my collection. I've never seen those anywhere! I'd love to win them! Thanks for the awesome giveaway! Sweet! You can never find any of the good Halloween stuff in Canada, do it would be beyond awesome to win! These polishes are so perfect for Halloween! My email is Rainbows.Music.Polish (at) gmail (dot) com. Oooooh, that is so cool! We don't have Rite Aid's around here so I'm never able to get the pumpkin or snowman polishes. I have yet to see these in a store - thanks for thinking of us! I love these! Thanks for giving away a set! Man, wish I could find these babies local to me! I'd stock up for sure! I would love to win them! I can't get them where I live! Thank you for this! I am not able to get them in my area. I haven't spotted the pumpkin polishes here, so I would love to win this set! Ah so fun! I love glitter and I love Halloween! Thanks so much! Ahhh I'd love to get my hands on these, they're adorbz! I would love to win these, we don't have any stores around here that carry them! Thanks for the giveaway! I have never seen these before! I want them sooooo bad! They look so cute! I'd love to win! I'm following by email and GFC. So cute, I wish some of the stores near me carried cute stuff like these. Oh, these look so fun and they don't seem to have them near me. Thanks! Seriously cool, both the colours and the bottles! Supercute. Sooo love that moon polish! the purple one looks amazing! vickers_73460 at yahoo dot com Thank you Mary for the chance at another great giveaway! I wish they had these somewhere in NY! they are so cute! Halloween is my FAVE season. OMG, these are sooooo cute, love them!! Halloween nail polishes!!!! We don't have those here in Portugal! One of the cutest things of Autumn :) count me in please: akuma[dot]kanji[at]gmail[dot]com. Awesome, I keep seeing reviews of these around and I love then. I love the copper one! *drool* These are not available where I live...! I've never seen these for sale anywhere - they are so cool! Such a shame you can't get these in England. Those polishes are so cute! I haven't been able to find those in my area! Awesome giveaway! I hope Blue Cross looks into creating an online store. I think there's enough demand for them. hautebeautybargin at gmaail dot com. I hope I win!! I don't have a Rite Aid anywhere near me. Thanks for the giveaway, even if I don't win. I love being introduced to new brands or polishes(Lynnderella!! ), and by following you I find them and get a chance to win some. Wow, what cute little sparklies - I love them!! They are so cute!! I would love to win them! I have never seen them before.. These look pretty interesting to try on Halloween, I hope I get it ;-) My email is kialaya[at]gmail[dot]com. Thanks very much. Love those pumpking polishes. Thanks for buying extras & having a giveaway. I want these so badly but they don't sell them anywhe near me. They are soooo cool :) Please enter me into your haunting give-away too! Thank you!! Oh yay! Even though I live where they are sometimes found, I haven't found ANY this year. halloween glitters!! :) thanks for the giveaway! I love these, but I can't seem to find them anywhere! Argh! Didn't find these at my Meijers. Awesome! Who doesn't need more glitter?!? This is an awesome opportunity as these aren't availalbe in my area! Hope I'm not too late! Worked all weekend - would love these! How can I this? I live in Brazil an I don't know any site of store to buy it online! 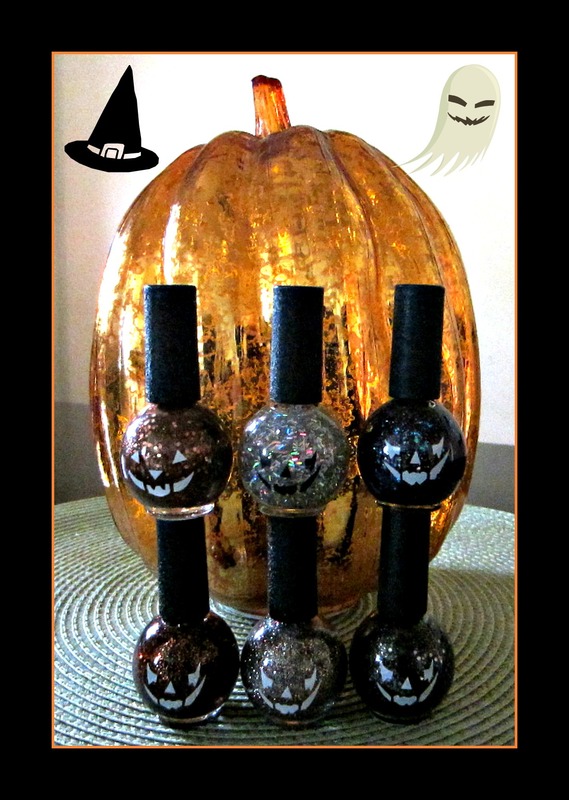 Cecilia~these are seasonal nail polishes that are only available at select drugstores during the Halloween season. I'm not aware of any place that sells them otherwise.